HOW INTEGRATED ARE SCHOOLS WHERE YOU LIVE? ALMOST half of Northern Ireland’s schoolchildren are being taught in schools where 95% or more of the pupils are of the same religion, The Detail can reveal. Our investigation into segregation in the school system has also found that 180 schools in the last academic year had no Protestant pupils on their rolls and another 111 schools taught no Catholic children. The seriousness of the religious divide in our schools was brought to the fore by First Minister and DUP leader Peter Robinson in October 2010 when he described the Northern Ireland education system as a “benign form of apartheid which is fundamentally damaging to our society”. In a bid to fully examine this issue, we used Freedom of Information legislation to request a breakdown of the religion of pupils attending every school in Northern Ireland. Detailed data was provided by the Department of Education for 1,070 schools and we used these figures to compile an interactive map which enables readers to easily access a breakdown for their local schools for the 2011/12 academic year – see above. We also requested similar data for the 1997/98 school year to see what has changed – if anything – in relation to pupil integration since the year the Good Friday Agreement was signed. In the last school year, 51% of schoolchildren were Catholic, 37% Protestant and 12% ‘other’ which includes other Christian, non-Christian and no religion/religion unknown. Some low figures were suppressed by the department to avoid identifying individual pupils of a minority religion in schools so we asked the department to carry out some overall calculations on our behalf with the raw, unsuppressed data. 493 schools in the 2011/12 year educated almost exclusively pupils of just one religion (95% or more) – compared to 827 schools in 1997/98. The total number of schools has reduced from 1,183 to 1,070. 20 controlled schools – the vast majority of them in the primary sector – had a Catholic pupil enrolment of more than 30% in 2011/12. 91% of Protestant primary children attended controlled (mainly Protestant) schools and 88% of Catholic primary pupils were enrolled in Catholic maintained primaries in the last academic year. At the same time, 88% of Catholic post-primary pupils attended Catholic maintained or Catholic managed voluntary schools and 89% of Protestant post-primary children attended controlled schools. Total pupil numbers have dropped from 340,940 pupils in 1997/98 to 311,559 in 2011/12. Integrated school pupil numbers have increased from 8,154 to 21,170. The full figures released by the department are available in Excel spreadsheets below this article and include a religious breakdown for all schools in 1997/98. The Integrated Education Fund said today that political handling of the core issues of division and segregation in Northern Ireland has involved “abandoned pledges and broken promises”. However, Education Minister John O’Dowd told The Detail that he has no power to direct anyone as to which school they should attend and he added that funding is available for schools to ensure pupils can take part in “meaningful engagement with those perceived to be different”. There were 62 integrated schools in Northern Ireland in 2011/12 – compared to just 33 in the 1997/1998 school year. We asked the Integrated Education Fund, which supports the growth of integrated school places, to comment on our findings. The fund’s chief executive Tina Merron issued a hard-hitting response, which we have published in full here. She said our figures show that the education system still remains deeply divided – despite there being a statutory duty on the Department of Education to encourage and facilitate integrated education. Mrs Merron also said that area-based planning offers an opportunity to design a more integrated school system but that in reality the process “is rooted in a segregated structure with not even a mere glance at integrated education”. 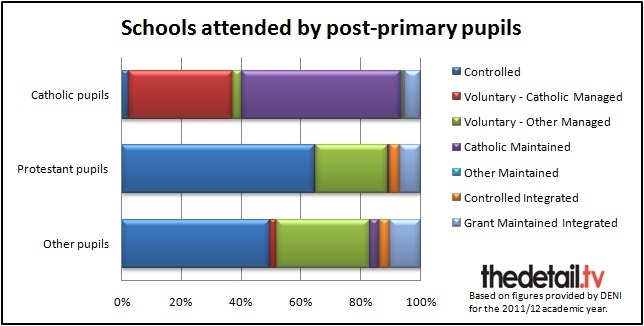 Ballykelly Primary School had one of the most balanced Catholic/Protestant enrolments of any school in Northern Ireland for the 2011/12 academic year. A total of 267 pupils attended the school – 43% were Protestant, 48% Catholic and 9% ‘other’. The school’s principal Helen Cole said: “We are a historically naturally integrated school because we serve the whole community of Ballykelly and surrounding areas. We are very privileged that the parents in this area choose to send their children here to be educated together. “Our school mission statement is to provide a caring, secure environment where individuals of all backgrounds, races and religions can feel welcome and valued and are encouraged to learn and develop to their full potential." Mrs Cole said that in the current academic year 45% of the school’s pupils are Protestant, 49% Catholic, almost 3% ‘other’ and a further 3% no religion. She continued: “We are very proud that our intake happens to be like this and we also have a similar balance in our staffing. “All clergy are welcomed into the school and we offer sacramental preparation to those Primary 4 and Primary 7 children who wish to make their First Holy Communion or to be confirmed. Most Catholic managed schools cater for a very small number of Protestant children. In the last school year 365 primary schools and 92 post-primary schools had a pupil population which was 95% or more Catholic. However, at three Catholic maintained schools and one Catholic managed voluntary school more than 30% of the pupils last year were Protestant. These schools were St Malachy’s Primary and St Columbanus’ College, both in Bangor, St Mary’s Primary in Comber and Dominican College in Portstewart. 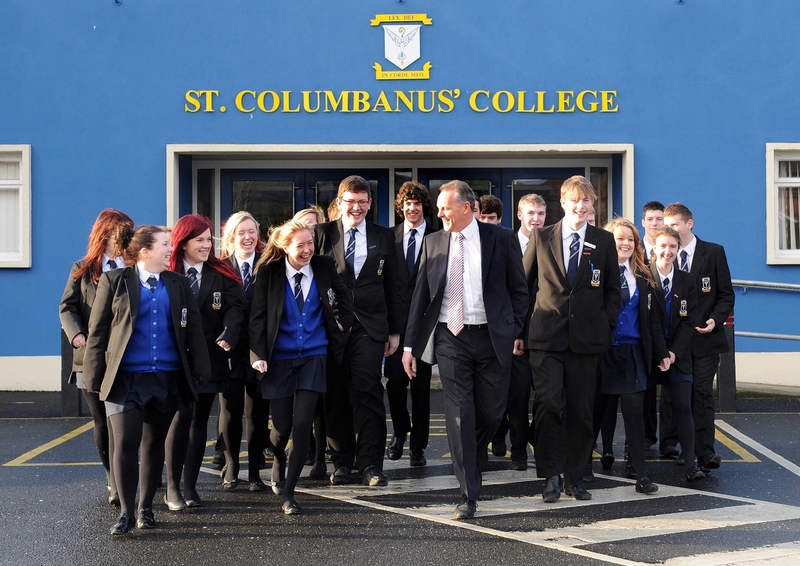 Liam Perry, principal of St Columbanus’ College, said: "Inclusion is at the heart of Catholic education, so it should not come as a surprise that St Columbanus’ College is acknowledged as an inclusive school. “Our college is fully committed to the intellectual, moral, spiritual, physical and social development of all of the children in our care. The emphasis on developing the whole child guided by clearly defined values and principles is a concept which many can support and buy into. “We have children who are Catholic, Protestant, of other faiths and none who attend our college. The work we do is underpinned by the values of the Gospel. We place great emphasis on the core principles of honesty, integrity, self – respect, mutual respect and working in the service of others. “Obviously these are not the sole franchise of Catholic schools but in our college they provide the fabric for our rich tapestry to flourish. “Our college mission statement refers to all of our children ‘achieving success in a happy and hardworking atmosphere where each child matures in a supportive Christian environment.’ In short, happy children achieve and it is in providing a supportive, caring, environment that success can be found. “We believe that inclusion is not simply about embracing diversity in terms of religion but also in terms of race, ethnicity and ability. Our perception of inclusion encompasses an acceptance of all of these and the celebration of the gifts of each of our children. All must be equally valued. Many controlled primary schools have a predominantly Protestant intake. However, at Greenhaw Primary in Derry 95% of the 278 pupils attending the controlled school last year were Catholic. Only six children were Protestant and nine were in the ‘other’ category. The school’s principal Vindi Torney said: “We are a controlled school and formerly Ballyarnett Primary. “The school still has four trustees from the Presbyterian Church who sit on the board of governors. The chair is the minister from the church, the vice chair is a WELB representative and is Catholic as are the parent representatives. I am a Sikh by birth and have been principal for 14 years. “The parents are aware that the school’s staff are from a variety of faiths. “Since the mid 70s, when most of the Protestant families fled the area, the school has relied on the Catholic families who live in the Shantallow and Carnhill districts in order to maintain numbers. “Greenhaw is the only controlled school in this immediate area and is surrounded by five maintained schools. The majority of our pupils continue to come from Catholic families. “Although we are not classed as an ‘integrated’ school our ethos is very much about quietly getting on and supporting every aspect of the education of the pupils in our care. Peter Robinson’s radical “benign apartheid” speech had the potential to be a major turning point for integrated schooling in Northern Ireland. The DUP leader said in October 2010: “If one were to suggest that Protestants and Catholics would be educated at separate universities it would be manifestly absurd; yet we continue to tolerate the idea that at primary and secondary level our children are educated separately. “I believe that future generations will scarcely believe that such division and separation was common for so long. The reality is that our education system is a benign form of apartheid, which is fundamentally damaging to our society. He said consideration should be given to tasking a body or commission to bring forward recommendations for a staged process of integration. 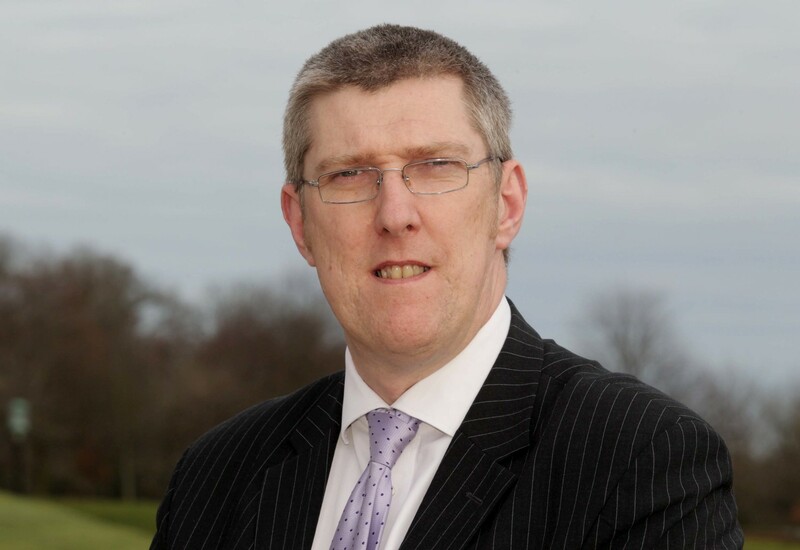 Wind forward almost two years after Mr Robinson’s radical speech and in July 2012 Northern Ireland’s Education Minister John O’Dowd announced the establishment of a ministerial advisory group to look at shared education. Its findings are due to be reported to the minister by February 2013. The department’s definition of shared education does not refer to any plans to create a fully integrated school system in Northern Ireland. Less challenging aims now appear to have been set by the department for more sharing and collaboration between different school types – and this is taking place while a separate area planning process is under way to restructure the entire education system including viability audits of every school. Even teachers continue to be trained separately in Northern Ireland with Stranmillis University College training staff for the state sector and St Mary’s University College preparing teachers for Catholic maintained schools. The very high number of surplus places in current schools is another major reason change and restructuring is needed. The department has confirmed that there were 82,472 unfilled places in Northern Ireland’s schools in the 2011/12 academic year. Funding around these costly empty seats across all of the school sectors adds pressure to the Department of Education’s tight budget. In July 2012, Secretary of State Owen Paterson said that over 90% of public housing in Northern Ireland is segregated. This means thousands of children are continuing to both live and learn with only others of the same religious background. Professor Tony Gallagher is Pro-Vice Chancellor at Queen’s University Belfast and former head of the university’s School of Education. We asked for his view on the Department of Education’s figures. He said: “Despite the fact that there has been a marked increase in the number and proportion of pupils who are categorised as ‘other’, the broad patterns in the data suggest that our schools remain strongly differentiated on the basis of religion, with only limited evidence of any change between 1997/8 and 2011/2. “There has been a significant increase in the number of pupils in integrated schools over that period but the overall proportion in that sector remains low. Professor Gallagher said that the Programme for Government has a commitment to ensure that all young people in schools have an opportunity to experience shared education by 2015. He continued: “I assume that the department does not want to include within this the myriad community relations programmes and short-term contact activities that have been tried for many years and found wanting. “If this is so then the most likely way to achieve the Programme for Government commitment will be through encouraging collaboration between schools and shared classes involving pupils from a number of schools taking subjects together – this is the approach adopted by the Sharing Education Programmes run by Queen’s University, the Fermanagh Trust and the NEELB, and has been a feature of some of the Area Learning Communities across Northern Ireland. “These shared education classes have the potential to provide a much higher proportion of pupils an opportunity to have sustained, regular contact with young people from other communities, in environments which are supportive and safe. Research led by Professor Joanne Hughes, Director of the Centre for Shared Education at Queen’s University, identified a relationship between increased opportunity for school based contact between pupils from different groups and more positive inter-group attitudes. The large scale survey of post-primary schools in Northern Ireland found pupils became less anxious, more comfortable and more positive about the other community when their school participated in the Sharing Education Programme. However, the extent of reconciliation between Catholic and Protestant pupils depended on how divided the area the schools were based in was. We asked Education Minister John O’Dowd to comment on our findings and also asked how he felt being the Minister of a system which remains so religiously segregated. He said: “It has to be remembered parents and pupils choose which school they would prefer to attend, I have no power to direct anyone as to which school they should attend. The Minister said that his department has put in place a new Community Relations, Equality and Diversity policy which is helping ensure that children and young people are encouraged to develop self-respect and respect for others through building relationships with those of different backgrounds and traditions. He continued: “Schools are obliged to follow this policy and funding is available to provide opportunities to put their learning into practice through meaningful engagement with those perceived to be different. “Furthermore, the curriculum provides opportunities for teachers to cover mutual understanding in the local and wider community; diversity and inclusion; community relations; citizenship; and cultural understanding. “I firmly believe that there is the scope, and need, for more shared education which will deliver quality education to all children, as well as equality, good relations and community cohesion benefits. “The Programme for Government contains commitments to advance shared education and in line with these I established a Ministerial Advisory Group which will report by March.